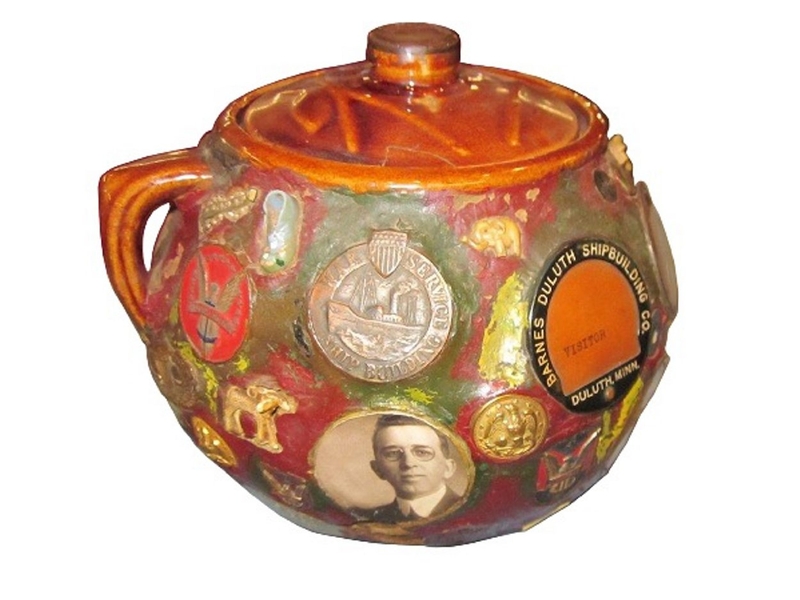 A tobacco jar was used to make this memory jar. Decorating it are campaign buttons and badges, a war service ship-building medal, a Duluth, Minn., ship-building visitor’s badge, a china shoe, small anchor and other items from the 1930s. It sold at Old Barn Auction in Findlay, Ohio, for just $72, probably because it had a chip on the lid. “Ugly jar” is just one of the names for an antique memory jar - and it often is an accurate description. But a homemade memory jar is of interest because it tells a story. The jars can be any shape, but the most popular with collectors today are jars made from 19th-century jugs or bottles. The jug or bottle was covered with a sticky material. It could be plaster, clay, putty or mortar. New ones are often covered with modern epoxy glue. The creator placed small objects like stones, buttons, broken glass, small figurines, watch parts, jewelry, doll heads, coins or even framed daguerreotypes in the plaster. Since the original idea of a memory jug is said to have started in Africa and related to water spirits, shells have long been popular. Traditionally the shells are broken to release the spirit of the deceased who inspired the jug. Today the jugs are considered folk art and sell for $50 to $300 at shows, but a few exceptional antique examples have brought up to $3,000. Most jugs can be dated by examining the things stuck in the plaster. Campaign buttons, coins and toy parts often suggest a date, but remember that new jugs can be made using old parts. Q: I’m thinking of selling an old Steinway upright piano and I’d like to give the buyer as much information as possible. What can you tell me about my piano? A: Steinway & Co. was founded in New York City by Henry E. Steinway, a German immigrant. He was born Heinrich Steinweg and changed his name when he immigrated in 1850. He and his sons began making pianos under the Steinway & Co. name in 1853. The Nov. 21, 1893, patent is for “improvements in string-frames for upright pianos,” and was granted to Henry Ziegler, a member of the Steinway family. The gold “coins” show that the company held royal warrants, which meant that they made pianos for members of the royal family. Queen Victoria granted the first royal warrant to the company in 1890. The serial number indicates that your piano was made in 1893. Steinway was bought by Paulson & Co. in September 2013.